What an awesome giveaway from French’s! 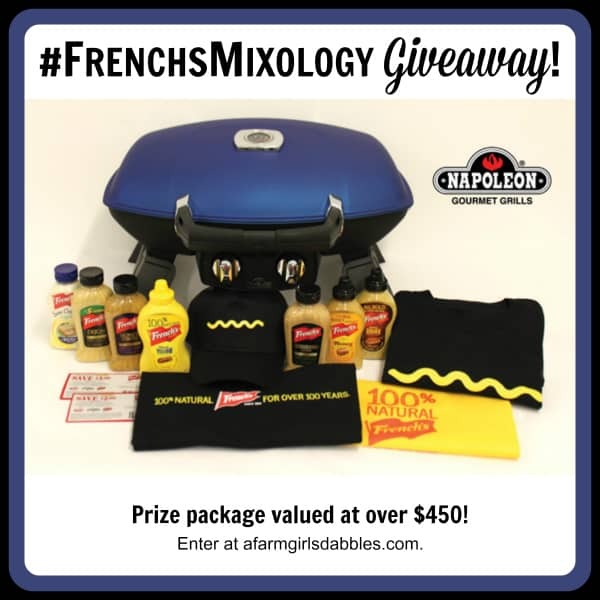 Thanks to their #FrenchsMixology mustard campaign, you could be entered to win a Napoleon TravelQ 285 Portable Grill, plus a selection of French’s mustards, coupons for French’s products, and a T-shirt, bag, and cap. It’s all worth over $450! Also be sure to check out my #FrenchsMixology recipe for Grilled Sriracha Honey Mustard Beef Kebabs. My whole family loves this easy recipe! To enter the giveaway, just use the Rafflecopter widget below. I want to know how you use mustard to liven up your meals at home. What’s your #FrenchsMixology?! Disclaimer: This post is sponsored by French’s Mustard, a brand you can always find in our kitchen. All opinions are my own. Thank you for supporting the brands I love that help make this site possible! Homemade honey mustard salad dressing. OMGoodness! I love to add mustard to any sandwich I make! it always makes a bland sandwich taste amazing! My favorite way to add flavor by using mustard is with a vinaigrette. I make this a lot and add different herbs to it. I add mustard to my deviled egg filling. It adds great color and flavor too. Thank you! I like to use Mustard when making marinades. I add it to AC vinegar and stevia as my salad dressing every dang day. I use it in salad dressings. I also use it in my baked bean recipe! I add it to my vinaigrette. I add it to my tuna salad! I use mustard in bean recipes- baked or even bean soups! I like to use mustard in sandwiches, deviled eggs, and mixed with honey for dipping sauces. Use mustard when grilling pork chops and ribs!! It’s the secret ingredient to my hamburger casserole. I add mustard to hamburger meat and then cook it in a pan with tomato sauce & pasta for a yummy meal. I use mustard as a dipping sauce with honey too. Great for dipping kebobs into! I love to add mustard to my marinades when grilling out. i add it to slaw, to salad dressings, whatever I can think of that could use a “zing”. salad dressing! Mustard is a great way to add flavor without a lot of calories! I add mustard to my homemade BBQ sauce. It’s the secret ingredient. I put spicy mustard in my deviled eggs and use it in marinades. I love adding a spicy mustard to my mac and potato salads! I use mustard in potato salad sometimes. Spicy brown mustard in deviled eggs…yummy. My husband’s favorite condiment on his sandwiches for work is mustard…straight up! I adore mustard on my french fries, coney dogs, and in potato salad! I add mustard to tuna salad, deviled eggs, and baked beans. I use mustard on and in many recipes. My all time favorite is white bread, bologna and plain yellow mustard though. A touch of honey mustard or grainy mustard on a grilled out bratwurst or sausage is my favorite. Those kebabs look so stinkin’ good! I really love to add a honey dijon mustard to my chicken breasts and then grill them. I also really love mustard on my chili dogs! Yum! I use French’s w/ everything! I add it to my Mac and cheese, tuna, homemade caesar salad dressing, and dip for pepperoni, cheese and crackers! Love it with most cheeses and I always put some in my potato salad, I just love mustard. I mix it with honey and use as a marinade on grilled chicken, also add diced fresh green peppers and onions to it for putting on top of grilled sausage sandwiches! Love your site!! I always coat my pot roasts in French’s mustard before I brown it and put it in the oven. It gives a nice flavor to the meat and the gravy I make at the end is delicious. I love to add it to my marinade for chicken! I mix together a super-tangy concoction of French’s mustard, Texas Pete’s, a few other top-secret ingredients and use it as an awesome, low-fat salad dressing. I hate salad dressings, so I like to use mustard instead of dressing on my salads. Love making salad dressing with French’s mustard, apple cider vinegar and spices to pour over grilled chicken salad. Yum! I used it in my dips and rubs when marinating chicken or serving it. I love to use mustard in my ham salad. Ham salad just isn’t ham salad without it. Thanks for the opportunity to win. Love your site. I use mustard in most of my salads, especially tuna salad! I add it to salads recipes, especially potato to give it that zing I love so much. I add mustard to my gluten free Mac And Cheese. Adds some Zip! I love to add mustard and butter to my brussels sprouts! I am from the south and I love a mustard based barbeque sauce for sure! YUM!!!! 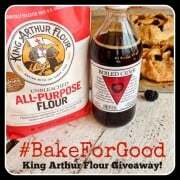 Thanks for sharing this fabulous post and giveaway and i so want to win! I add ketchup, mustard and brown sugar to my sloppy joes. The mustard makes it taste great! A little of mustard will zest up a lot of meals I cook up. I love mustard on a lot of things. My fav thing to eat with is hot dogs though.. I add it to my sloppy joe’s! We use it a lot on sandwiches & in potato salad & tuna salad. We use it in marinades!! I want that chipotle honey mustard sauce Christie commented earlier that she makes! I love adding mustard to my tomato tart pie; ran out one time and it just didn’t taste right without the mustard. I use it on my Turkey sandwich and my 16 year old uses honey mustard for his chicken tenders . A little mustard in my mac n cheese adds so much flavor. I use mustard as a rub on meats for the smoker. It helps hold the spices on the meat, adds flavor and moisture and even helps tenderize it. Marinades! A little can go a long way in a marinade. I put some in my egg salad. I like to make honey mustard. I like putting mustard into homemade vinaigrettes or tossing red potatoes in some before roasting. I like to mix mustard into my own baked beans along with some other ingredients to make it great. Thanks for the chance to enter. I love French’s mustard on my ham & cheese sandwiches. 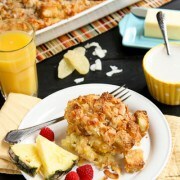 I also add it to a delicious breakfast casserole. Probably my favorite dip is Honey Mustard. I think mustard is great with almost any meat! I love mixing mustard with honey to make a vinaigrette for salad. 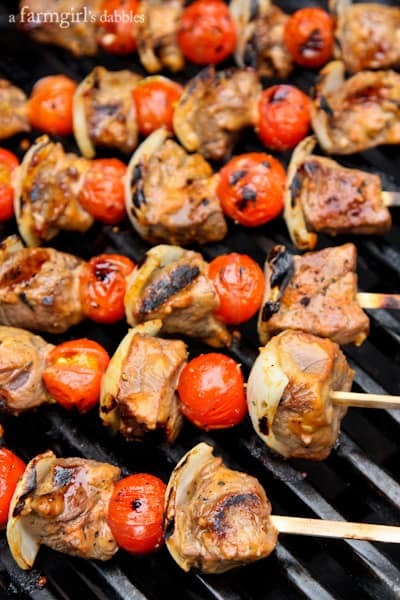 Those kebabs look delicious on the grill….I bet they smell amazing. My favorite use for mustard (outside of using regularly on grilled meats) is to treat minor burns–it works great! We add it to marinades and in macaroni salad, but my favorite way to use mustard is as a condiment. It’s hard to choose :). I guess my favorite is homemade Carolina BBQ sauce. I like to add mustard to bbq sauce. I use French’s for deviled eggs, mixed with jams for burgers, and crab cakes, and of course sandwiches. We love to add mustard to our dishes. We put it in baked beans, on chicken and love to use it in potato salad. I always put a couple teaspoonfuls of Yellow Mustard in my meatloaf. Delicious! I love mustard on sausage biscuits. I love to add a bit of mustard to homemade salad dressing. My favorite is homemade honey mustard dipping sauce. I add it to my Avocado Egg Salad sandwich. I love adding different spices! I use mustard in many marinades and potato salad. I always add mustard to potato salad or in homemade BBQ sauce. I like adding it to marinades or sauces, especially tomato based ones. I always use mustard in my potato salad. I love it with any kind of chicken! I love honey mustard with salmon or sardines! I add a bit of mustard to deviled eggs (and potato salad). Using mustard as a marinade on lamb chops adds a surprisingly mild but wonderful flavor. I love marinating meat in mustard! I love making honey mustards. I made a kicking chipotle honey mustard that I wanted to eat with a spoon! I like mustard when I am having turkey sandwiches on dense bread. I add a little red chili pepper flakes for some heat. i put mustard in my mac n cheese… delicious! I love it on a turkey wrap and always put it in my tuna. I mix mustard in with Greek yogurt to make a great sauce for chicken. I like to add mustard to marinades and bastings like with chicken especially. Gives it such a great flavor! A little mustard jazzes up almost any salad dressing or marinade. i love hot mustard on everything even chips!!!! i use it had a spread on samwiches. i prefer it just for dipping. I love to put some mustard on ham while baking. I also love mustard on sandwiches, and in potato salad. I love to use mustard in marinades and I absolutely love spicy brown mustard on my pretzels! I love adding it to my sandwiches! Mustard goes great with anything and everything. Love it on my burgers and hot dogs. I love to kick up my ribs with a dab of French’s mustard. It adds the perfect amount of extra flavor. Thank you for the wonderful giveaway. Spread it on a bun or bread. I also like to top my salads with it. I love mustards in Salads – Macaroni, Potato, almost any salad & dressing! My favorite way to add flavor with mustard is making Roasted Pork Chops with Mustard Sauce. YUM! I love mustards as a glaze for roast pork and chicken! Also love it in my potato salad! Love to use mustard as a marinade! I love using mustard in dressings and marinades. MMM! I like mustard in salad dressings and on baked chicken breasts. My favorite way to add flavor with mustard is to put it in marinades. I like to add mustard in my sandwiches and hot dog. With horseradish on brats and in my southern potato salad. I like to use i on lots of stuff, its real good in a marinade I like. I always add mustard when I make salad dressing. I like to slather it on chicken before baking. We use mustard in pan sauces , dressings, and last night we made a ham and cheese cornbread bake from Southern Plate that had mustard in the cornbread. So good! I use a little honey and spicy mustard on string beans. It gives it an unexpected flavor! I use mustard on just about everything – I love mustard. Mustard and mayo are my favorites for every sandwich and a must. I have to have mustard on my sandwiches. I love yellow and spicy mustard; so good. I love mustard on cheese sandwiches, hot dogs and hamburgers. Mustard is good on lots of dishes. I like adding Mustard to dressing and marinades. I put it on potatoes, different kinds, and either grill or bake them. It’s a tasty and healthy way to prepare them. Ham and mustard sandwich ftw. So simple and classic! I like to add mustard to potato salad and egg salad sandwiches. I love to use it at a spread, as a rub and as an addition to sauces and dressings!! Our family is a mustard loving family!! Thank you! We love using mustard in our house…my fiancé is obsessed with mustard. I used it when I made ham for easter – I covered it with stone ground mustard and cherry preserves – SO good. I also make a Dijon cream sauce that I put over pork tenderloin and it adds so much flavor!! I love to make a paste with mustard, butter, and steak seasoning to top a roasted pork loin. 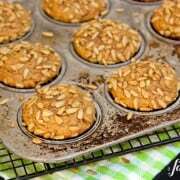 Super easy, and fabulously tasty!!! I use mustard in sauces and dressings to give them a little kick. in sandwiches, lettuce wraps, burgers and I even spread dijon in my grilled cheese and pitas! I add whole grain mustard to sour cream to chicken breasts (either wrapped in pastry or bare) and bake them. Oooooh soooo good! I haven’t really experimented with mustard – usually just add it to my hotdog or spicy mustard on sandwiches…I have used dijon mustand on salmon before – definitely going to try your kebab recipe! The #1 condiment is Cannot do without! I use it everyday in some recipe I’m making! I use mustard in sauces and dressings, and even in my tuna!